Our house is a small one, and except for Christmas, this porch is the primary spot for seasonal decor like a touch of pink. I often receive questions about its origins. I think the little shepherd is John the Baptist as a child based on his clothing and the cross. In many Italian renaissance paintings John the Baptist is depicted as a child in similar clothing handing a bare infant Child the cross sometimes with a sheep present too. But I think it could be either child or even an angel. It really is what you see in it. It came from a local shop that sells French furniture. Each year the scene is altered a bit. Last year, these little rabbits in a similar style were added to the display, and they came from Hobby Lobby for just a few dollars. I actually found vintage ones, but passed due to the price. This is a toile remnant, and the rabbit was given some dried roses. Pretty old bottles and containers make great vases, and these are soda and food containers. Someone local made this particular bunting. 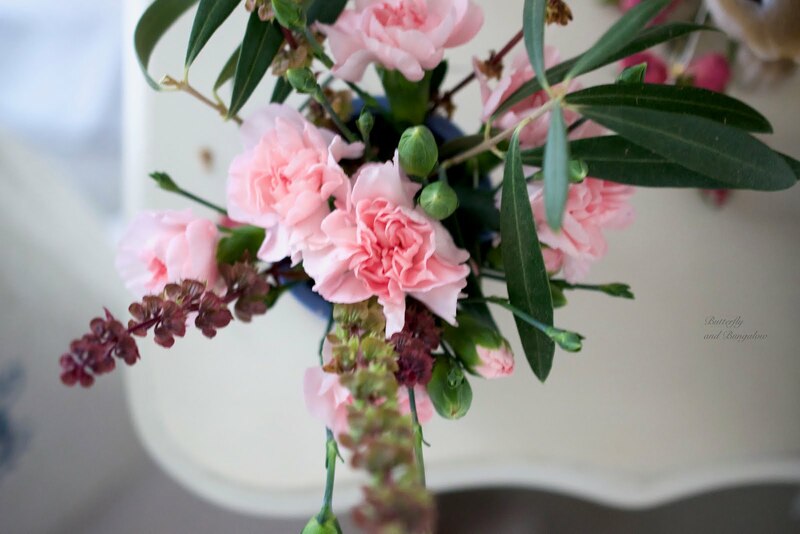 The bouquets were made with flower market mini carnations, but all the fillers are from our garden. Carnations last a long time. I left the stars up, because they remind of the ceiling of Giotto's chapel (Scrovegni Chapel in Padua). Finally, a crown from a local vintage shop was placed on his head. To me, this little scene recalls the northern Italian countryside shrines placed along paths and hiking trails. This can be seen from our front door, and it is always a welcoming sight to eyes when returning home. There is a set of twinkle lights hidden behind for ambiance. 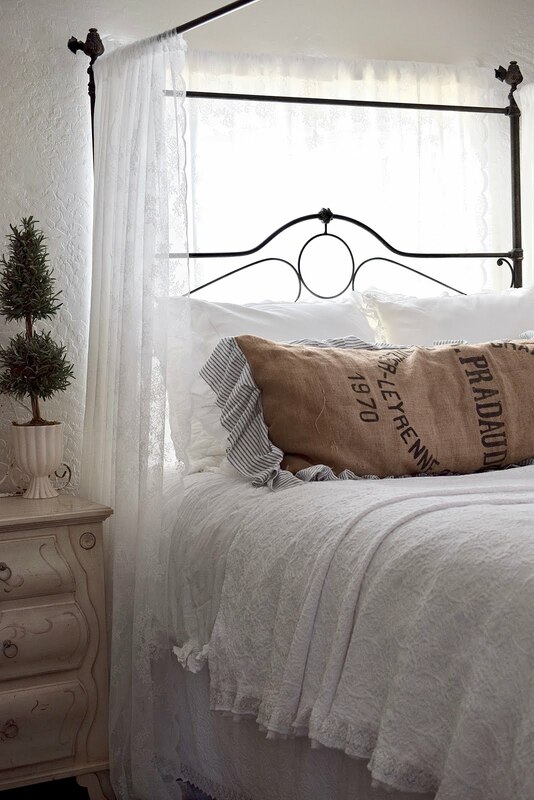 Do you create a shrine or a sanctuary spot in your home? So charming. I’d like to see it at dusk with the tiny lights. 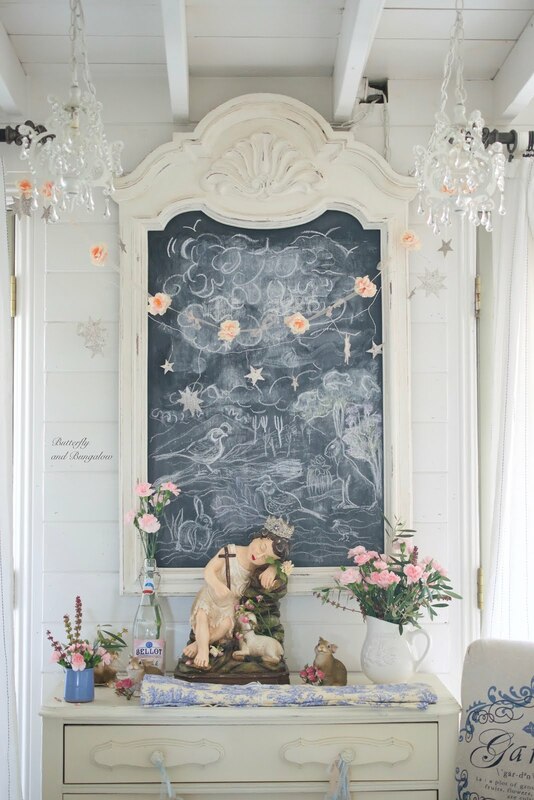 Always love love your porch Su and your vignettes are always gorgeous out there. Happy Friday and have a wonderful weekend. I always enjoy your vignettes. They make me smile and I find inspiration to create some thing fun here at my home. We will be decorating for Spring this weekend. How beautiful your vignette is. What a perfect spot to usher in Spring and remind those who are living in the snow, that Spring is almost upon us. I could live happily on that cozy and peaceful sleeping porch. That statue is amazing and what makes it perfect is the tiny delicate crown that you selected for it. 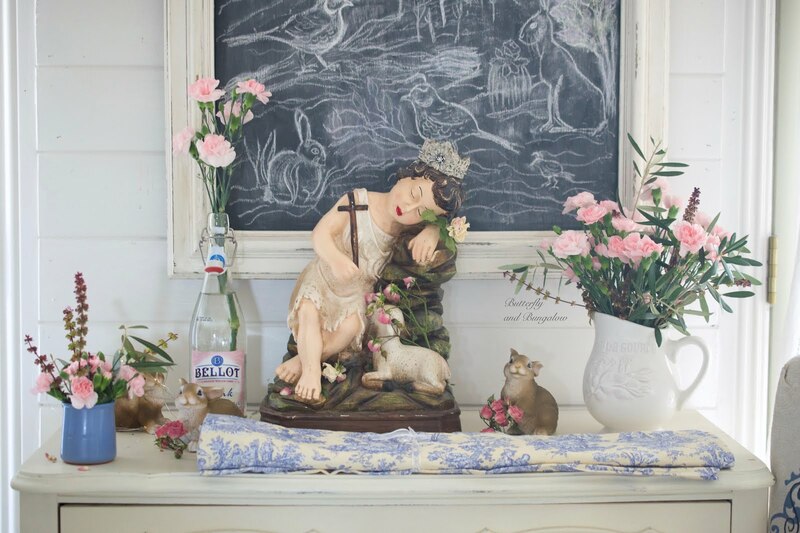 I too love vintage statuary, crowns, rabbits and lacy buntings and of course tiny cottages that we both live in. So, this is a perfect post filled with lovelies and my favorite things. 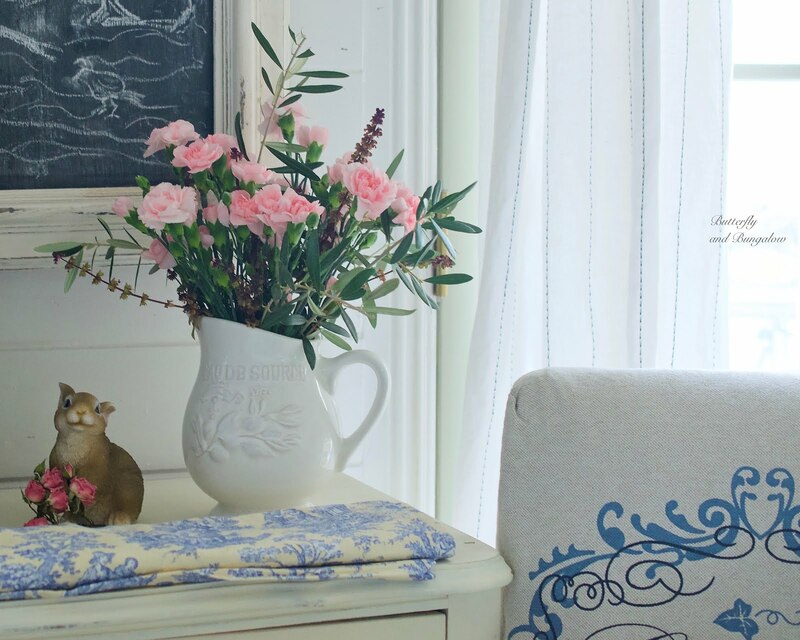 Your simple yet beautiful flower arrangements are a perfect addition to a magazine worthy vignette. That darling bunting is oh'so-sweet. I have a coffee table on wheels, that I often use as a shrine of sorts for purposes of meditation and prayer. Very easy to roll out of the way. I also create special spots or shrines in the woods behind my home. Just a place to stop, breathe and be mindful of life's blessings. Happy Spring filled with blessings. Su- Your porch is so sweet and I love that sweet figure. He is just beautiful and I think you are right with identifying him. I love Spring and can't wait for it. No, but I like yours. It does feel as if it is a scene in Italy. Always love to see your porch and your different decorations. Looks very good. I am so ready for Spring. My peach tree has blooms, a little to early and my iris are also blooming too. Our January was to warm/hot. Yes I have an altar area in my living room on a corner table. It's expanded over time. I have a beautiful framed photo of Yeshua and the Buddha, a Mother Mary statue, an enigmatic framed photo of the Magdalene with an egg, depicting a mystery, a Krishna statue as well as a Shiva one with some other things scattered around and candles etc. So beautiful. I`m waiting for the spring, but we have -17 C, so it`s not here yet. I always enjoy the way you decorate your sleeping porch Su. It looks so lovely for spring and I hope you get a lot of enjoyment from spending time out there. 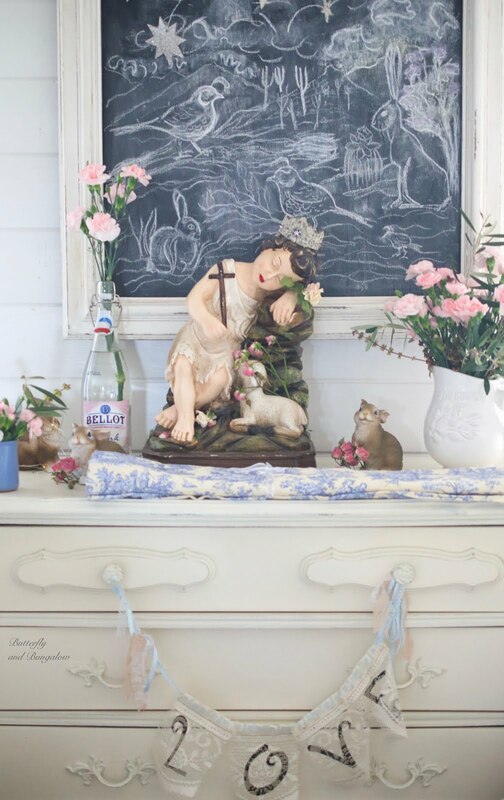 Thank you for sharing your porch at 'Create, Bake, Grow & Gather' on Shabby Art Boutique this week. 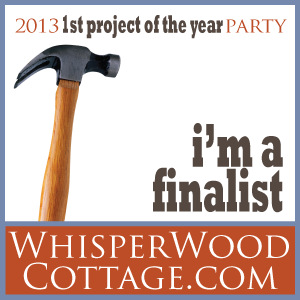 I'm delighted to be featuring this project at tonight's party and pinning too! This is an adorable decoration for spring.